There are also four window panels in the church dedicated to the Parishioners who gave their lives in the Great War. Local history and Church records including Monumental Inscriptions, can be accessed in Holy Trinity Church on Mondays between 10.30am and 2.30pm when volunteers will be present to help you plus teas and coffees are available. More information here. 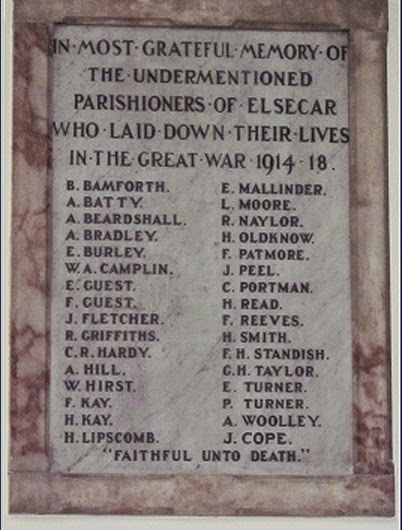 Update April 2015: A limited edition book, Parishioners of Elsecar who laid down their Lives in the Great War, has been produced by Graham Noble with the assistance of members of the Elsecar Family History Group who meet at the church as mentioned above. A copy has been deposited at Barnsley Archives. It also contains information on men remembered in the churchyard and many more WW1 soldiers who have been discovered during research to have a connection with Elsecar.